Returns the FieldInfo structure for a column. Returns the field name for the a column. Creates a new abstract list model. A Wt MVC Model to view/edit query results. The model fetches results from the query and presents the data in a table. It supports sorting the underlying SQL query using Query::orderBy(). The default implementation of data() converts Query results to model data using query_result_traits<Result>::getValues(). You may define your own data presentation using the underlying Result by specializing data() and accessing data from resultRow(). You may selectively add fields that you want to display using addColumn(), or you can also add all columns based on the query using addAllFieldsAsColumns(). The model supports editing of the underlying data (even if the underlying query fetches results from multiple tables!). Values in columns that correspond to fields that have been mapped (and are writable) in a Database Object can be edited. The default implementation of setData() uses query_result_traits<Result>::setValue() to manipulate the database object, and thus uses the same write-behind properties as ptr<C>::modify(). To customize editing, you can specialize setData() and use resultRow() to modify the result object directly. The model supports also inserting rows (only at the end), and removing rows, which are reflected in object additions and removals from the Session. Editing is directly to the underlying database objects (change, insert and remove). Note that these changes will be flushed to the database whenever a transaction is committed, or before a query is run. 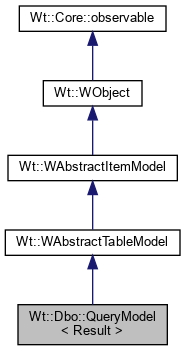 The model will not explicitly create a transaction for the modification, but since the model uses a query for reading data, the change may be committed to the database depending on how the model is loading data. Still, this implies that usually inserting a row and setting its data happens within a single SQL "insert" statement. Moreover, the model will try to fetch a batch of data even if you ask for the rowCount(), which may provide the row count as a side-effect if the query returns less results than a single batch size. If you do not want this behaviour (which might be the case if you are only interested in rowCount(), not the actual data) then you can avoid this behaviour by setting batchSize to 0. Creates a new query model. You need to seed the model with a query using setQuery(). Adds all the columns from the field list. All fields are added as columns. Fields that are mutable are marked as editable columns. This is a convenient alternative to selectively adding columns using addColumn(). The field name may be a qualified or unqualified field name. The list of available fields can be inspected using fields(). The header is used as Wt::ItemDataRole::Display for the column header data. For the column items, flags() will returned the given flags. For example, to indicate that a field is editable, you can set the Wt::ItemFlag::Editable flag. This is an overloaded function for convenience, which uses the field name as the header value. Adds a row to the session. This method is called from within insertRows() to add (and save) a new result row to the Dbo session. The default implementation uses query_result_traits<Result>::add(). Returns the batch size for fetching results. Returns the number of columns that have been added using addColumn() or addAllFieldsAsColumns(). Since the query model implements a flat table model, this returns 0 when parent is valid. Create specialized orderBy clause for sort. The sort() method calls createOrderBy() to format a SQL clause for use in Query<BindStrategy>::orderBy(). The default is to return a string that will sort on a single column in the specified order. Customize this method if you need a more complex orderBy clause, e.g. to break ties consistently. This method is called from within insertRows() to create a new row. The default implementation uses query_result_traits<Result>::create(). Returns the data for an item. Returns data of type Wt::ItemDataRole::Display or Wt::ItemDataRole::Edit based on the field value corresponding to the index. If necessary, this fetches a batch of results from the underlying database. Deletes a row from the session. This method is called from within removeRows() to remove (and delete) a new result row from the Dbo session. The default implementation uses query_result_traits<Result>::remove(). Returns the query field list. This returns the field list from the underlying query. Returns the flags set for the column using setColumnFlags(). Returns the index of row. If the row isn't contained in the model, returns -1. Row insertions are only supported at the end (row == rowCount()). For each added row, a new result is added to the underlying database. Rereads the data from the database. This invalidates the current (cached) data and informs views that they should rerender. This emits the layoutAboutToBeChanged() signal to inform the views that data and perhaps also row count was changed. Removes one or more rows. For each removed row, the result is removed from the underlying database. Returns a result by id. This should be the inverse of the resultId() function. The default implementation uses query_result_traits<Result>::findById(). This should, if possible, identify the result using a unique long long id, and otherwise return -1. The default implementation uses query_result_traits<Result>::id(). This is required for a working stableResultRow() implementation. This returns the result corresponding to a particular row, and could be used to customize the model behaviour, e.g. by specializing data() for certain columns. Returns a const reference to an entry in the result cache. This returns the result corresponding to a particular row, and could be used to customize the model behaviour, e.g. by specializing setData() for certain columns. Returns a reference to an entry in the result cache. Returns the number of rows return from the underlying query. Sets the batch size for fetching results. The model fetches results from the query in batch, and caches these in memory to avoid repetitive querying of the database. The default batch size is 40. For items in column column, flags() will returned the given flags. For example, to indicate that a field is editable, you can set the Wt::ItemFlag::Editable flag. If role = Wt::ItemDataRole::Edit, sets the value for the field corresponding to the index. All other editing is ignored. Sets header data for a column. The model will return this data in headerData(). Only column headers are supported (orientation == Wt::Orientation::Horizontal). The query is used to query the database. Unless keepColumns is true, this resets the column list, so you will need to (re-)add one or more columns using addColumn(). When keeping the current columns, a LayoutChange rather than a Reset is emitted by the model, allowing views to keep their column geometry as well. This sorts the model by changing the query using Query<BindStrategy>::orderBy(). Returns a stable result row. This return the same result row as was previously returned by resultRow(), even if there were database inserts going on. This requires suitable implementations for resultId() and resultById() functions. If the row wasn't fetched before (or since a reload()), then the result of resultRow() is returned instead.